Beginning pretty much right out of college, I spent more than 20 years as an editor for the sports pages of The Boston Globe, perennially celebrated among the best sections in the country. It was a wild ride with bunch of guys who partied hard but worked harder, and over the years I came to feel like I was part of a family. We had a lot of laughs both in the office and out, playing softball together, drinking beer afterward, even going away, en masse, on vacations we relive to this day. As an editor, I utilized my writing talents to tweak any twisted syntax that came my way and also to adorn the pieces I worked on with those jazzy headlines for which Globe Sports is famous. Occasionally, I would write a news or feature story of the paper . . . though none that I can find online. Yeah, I’m a dinosaur. I left the newspaper in 2005 to help launch a magazine called Wondertime, and when that publication went belly up four years later I returned to the Globe’s pages. Initially, I wrote features not for the Sports Department but for Arts. Then again, the opera singer I interviewed did once play in the NFL. And the Broadway-bound play I previewed was about a Hall of Fame pro football coach. (The actor in the lead role phoned me 10 minutes before our scheduled interview slot and said, “I’m on Lombardi time.”) Even the avant garde theatre troupe I visited had a sports connection: the vigorous weekend soccer games the actors used to remain physically engaged in their creativity. Eventually, in 2011, I found myself back in The Globe’s sports section, covering college basketball and football games. I’m done with that, but I still do contribute the occasional arts feature. And now I also co-author a monthly parenting column, notable for its against-the-current devotion to never dispensing expert advice! Check it out here. As for my sports coverage, you can find game story after game story with a search of BostonGlobe.com. Below, I’ve linked to a couple more Arts features. 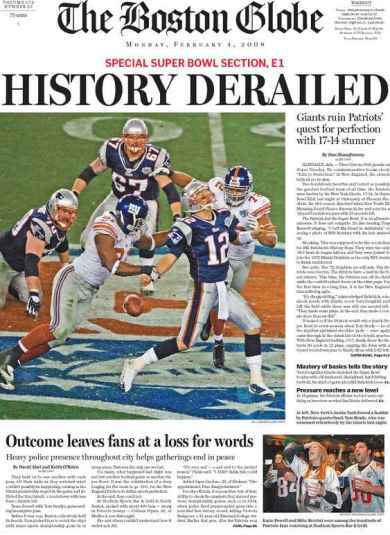 Before you go there, though, take note of the Page 1 image I used above: It’s from a publication date after I left the Globe staff, but it was too irresitible for this Giants fan to pass up. Making a Splash: With “Pool Boy” set to make its premiere at Barrington Stage, everything’s going swimmingly for playwright Nikos Tsakalakos. Lost in “Space”: Kid Koala’s new graphic novel becomes an immersive musical experience at Mass MoCA. results, on the world scale. I minored in english lit and math, finally deciding to make a little bit more money in the science technologies work building tools to make new airplanes then coordinating the airplane production lines them selves. We made the companies billions refining the manufacturing methods while they paid us spit by comparison. There is no justice. There is a God however and He had His way with the trillionaire moguls, I hope anyway. I trust Him. Hey Jeff, have a great day huh.